Water Tube Industrial Boiler Market size was valued over USD 7 billion in 2017 and annual installation is anticipated to exceed 60 thousand units by 2024. Escalating demand for energy efficient heating units along with rapid industrialization across developing economies will drive the water tube industrial boiler market size. Expansion of industrial infrastructure coupled with growing initiatives toward energy conservation and adoption of energy efficient steam generating systems will further complement the business landscape. Rapid industrialization along with growing deployment of captive power generating systems across chemical and food processing sectors will stimulate the water tube industrial boiler market growth. Positive outlook toward the adoption of low-emission heating systems with gradual replacement of conventional units will further support the business growth. <10 MMBtu/hr boilers market size is anticipated to witness growth of over 4% by 2024. Introduction of stringent norms to minimize carbon emissions along with efforts to achieve energy optimization across manufacturing facilities has led to the deployment of energy efficient heating systems. Furthermore, the revival of commercial and industrial sector followed by the global recession of 2008 coupled with the growing demand for space heating boilers will drive the demand for low-capacity boilers. 100-250 MMBtu/hr boilers are primarily installed across industrial facilities including primary metal manufacturing and paper & pulp industry and refineries. Rapid industrialization, most notably across Asia Pacific along with the growing manufacturing industry in the Middle East and Africa will stimulate the industry landscape. 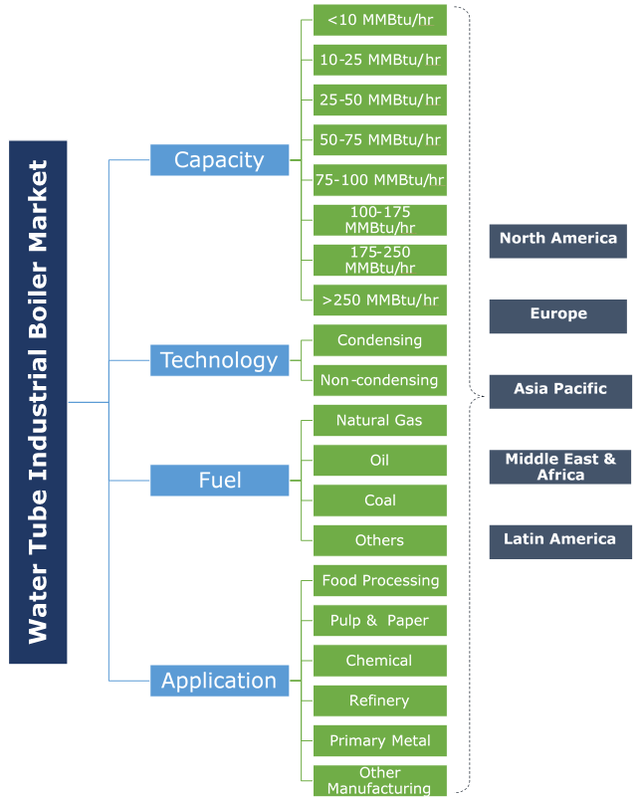 ≥250 MMBtu/hr boilers in 2017, accounted for over 13% of the water tube industrial boiler market revenue share. Ongoing industrial sector investments in developing economies will stimulate the demand for high capacity boilers. In North America and Europe, the demand for high capacity utility boilers is dominated by the need for replacement of existing inefficient steam generating units. Food processing in 2017, accounted for over 16% revenue share of water tube industrial boiler market. Shift in dietary habits toward high value-added foods and changing consumer lifestyle trend will favor the demand of processed food that in turn will encourage the deployment of these steam generating units. Positive outlook toward chemical industries coupled with the expanding refining units will drive the water tube industrial boiler market growth. The industry expansion is attributed to rising per capita income across developing countries leading to considerable increase in refining capacity additions. Refineries across the globe are focusing toward efficiency enhancement and capacity expansion which will propel the demand for high capacity industrial boilers. Condensing water tube industrial boiler market size is set to expand over 4% by 2024. Reduced heating costs, high efficiency and low environmental pollution are some of the prominent features that makes product deployment preferable over other alternatives. Furthermore, ongoing government initiatives toward adoption of low emission systems will drive the industry growth. Non-condensing boilers over the years have witnessed a substantial penetration across various industrial sectors including food processing, chemical, refining and metal manufacturing. Low cost, ease of installation and the ability to withstand wide temperature fluctuations are the key factors that will boost the product demand. Oil fired water tube industrial boiler market size is set to grow on account of the product’s low installation cost and competitive fuel prices. The provision of cost-effective heating units coupled with the ease of resource availability will further influence the global manufacturers to use oil as a fuel for heating systems. Natural gas fired water tube industrial boiler market size in 2017, was valued over USD 1 billion. Regulatory norms toward adoption of low-emission fuels will drive the demand for natural gas boilers. The European Union has set a target to reduce GHG emissions by 40% by 2030 as compared to the 1990 levels which in turn will propel the replacement of conventional high-emission fuel boilers. The U.S. water tube industrial boiler market will witness growth on account of increasing investment toward expansion of industrial facilities and replacement of conventional heating units. Sizeable growth in the refining capacity to cater to the escalating demand of petroleum products coupled with government ventures aimed at optimizing the country’s manufacturing capabilities will further stimulate industry growth. Europe water tube industrial boiler market will witness a significant growth owing to favorable policy framework along with rising investments across commercial and industrial sectors. The introduction of rigorous regulations & standards toward carbon emission reduction along with the replacement & retrofitting of existing heating systems will stimulate the industry growth. The replacement of existing boilers to meet the emission standards will further support the business landscape. Prominent players operating across the water tube industrial boiler market include Bosch Thermotechnology, Cleaver-Brooks, Thermax, AMEC Foster Wheeler, Siemens, Bharat Heavy Electricals Limited, Babcock and Wilcox, Hurst Boiler, Mitsubishi Hitachi Power Systems, Doosan, General Electric, Fulton, Forbes Marshall, and Cochran amongst others. Inorganic growth ventures, regulatory compliance and development of new and innovative products are crucial strategic assets to gain a competitive position in the business. For instance, in July 2017, Bosch Thermotechnology forged a strategic collaboration with China Vanke Co., to extend its boiler business. The partnership established Bosch as a sole supplier of wall-hung boiler and after-sales services for Vanke in Shanghai. Water tube industrial boilers are primarily installed to produce hot water and steam for commercial or industrial applications comprising pulp & paper, food processing, chemical, refinery, primary metal and other manufacturing industries. It is an assembled unit that consists of mud or water drum, tube and other components.